You might be wondering how to get rid of canker sores (aphthous stomatitis). A canker sore is the most common mouth ulcer. It appears as a white or sometimes yellowish open sore in the inside of the mouth, lip, or cheek and can be very painful. The surrounding area of a canker sore is usually red and inflamed soft tissue. Simple canker sores happen about three or four times a year, normally in people between the ages of 10 and 20. There are also more complex cases of canker sores. These occur in people who have previously had issues with canker sores. Neither simple nor complex canker sores are contagious. How Do You Get Canker Sores? Canker sores are a fairly common condition for many people. Roughly 20% of people will experience canker sores throughout their lifetime. Canker sores don’t affect any one gender more than the other, which is one reason it is so common. Aloe vera has both anti-inflammatory and antibacterial properties. This makes it one of the best natural remedies for treating canker sores. There are a few ways to use aloe vera. You can apply the gel from the leaf directly onto the canker sore multiple times throughout the day. Rinsing your mouth with aloe vera juice three times a day is another method. Or just drinking a couple of tablespoons of the aloe vera gel up to three times for the day also works well. The antiseptic qualities of honey make it an excellent option for treating canker sores. Honey also has antibacterial properties that helps get rid of the canker sore in your mouth fairly quickly. You can apply a teaspoon of honey on and around the canker sore. At first you will feel some pain, but that will go away within a few minutes. Repeat this periodically throughout the day. Another option is to mix the honey with turmeric and use it as a paste to apply to the canker sore. Done this way, you’ll only need to repeat twice daily. One of the best natural remedies for treating canker sores. Similar to honey and aloe vera, coriander has antiseptic and anti-inflammatory properties. But it also contains antifungal properties that make it that much more potent of a treatment against canker sores. You can boil the leaves in some water and gargle it once cool. You can boil and strain coriander seeds and do the same thing. Or you can simply drink coriander juice from the leaves throughout the day. Why salt works so well at getting rid of canker sores is because it draws out the fluid. It only takes a teaspoon of salt in one cup of water to make it work. Rinse your mouth with this solution about three times a day. You can even put a touch of salt right on the canker sore itself. It will hurt, but will speed up the healing process. 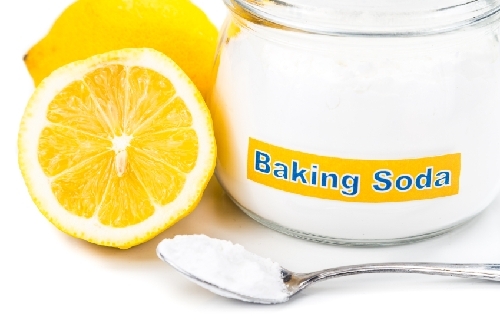 Baking soda works well to ease some of the pain of canker sores and reduce the inflammation. Adding a teaspoon to some water will create a paste. Apply the paste to the canker sore and leave it on for a few minutes before rinsing with warm water. If nothing seems to be working and canker sores reappear frequently, then it may be time to consult a doctor or even a dentist. They will be able to help you figure out any nutritional deficiencies you may be suffering from or create a natural supplement plan to prevent canker sores from coming back. Khan, A., “Canker Sore,” Healthline web site; http://www.healthline.com/health/canker-sores#Overview1, last accessed January 8, 2016. “Canker sore,” Mayo Clinic web site; March 19, 2015; http://www.mayoclinic.org/diseases-conditions/canker-sore/basics/prevention/con-20021262. “How to Get Rid of a Canker Sore Fast,” Top 10 Home Remedies web site; http://www.top10homeremedies.com/how-to/get-rid-canker-sore-fast.html, last accessed January 8, 2016.